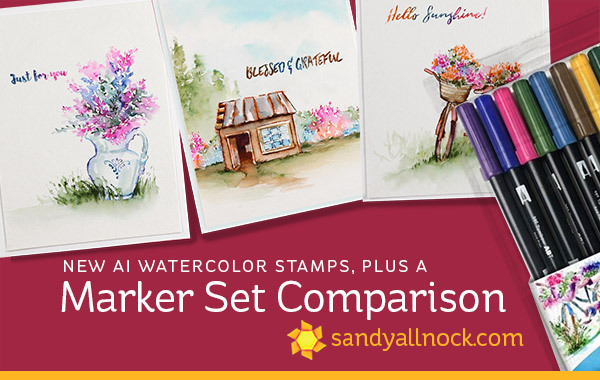 The new release of Art Impressions stamps is a great opportunity to check out some marker sets and compare them for colors – so that’s what I’m up to today! 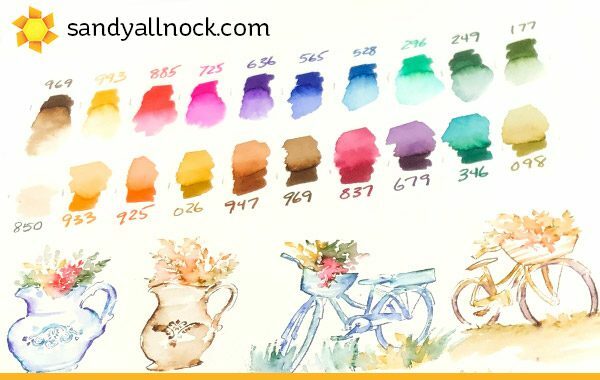 There’s a little bit of technique in here, but lots is about whether you want bright colors or more vintage or natural colors in your art. 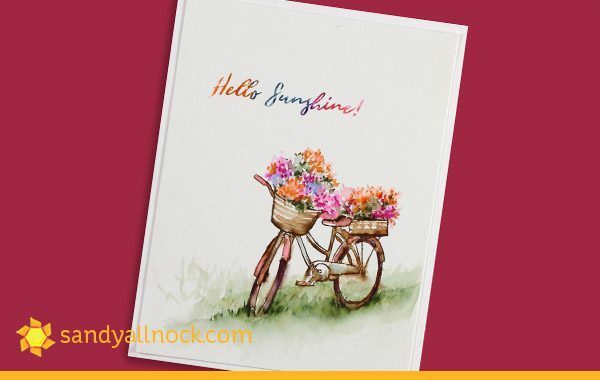 It’s always good to create a practice page – whatever AI watercolor stamps you get, stamp them a bunch and play around with what colors and arrangements of the flowers you like best, and how much water is appropriate for your style, marker brand, and paper. 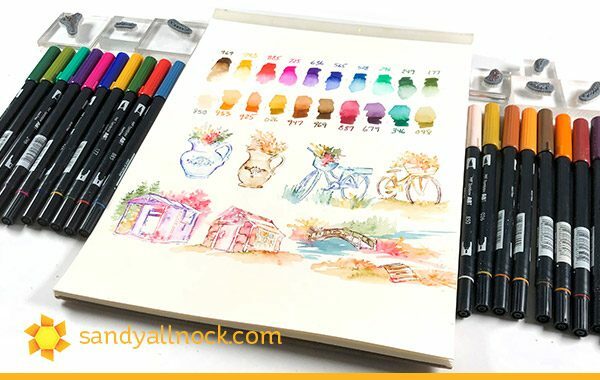 These two sets of 10, by the way, aren’t Tombow’s picks – they’re by Bonnie Krebs, the owner/designer at Art Impressions! 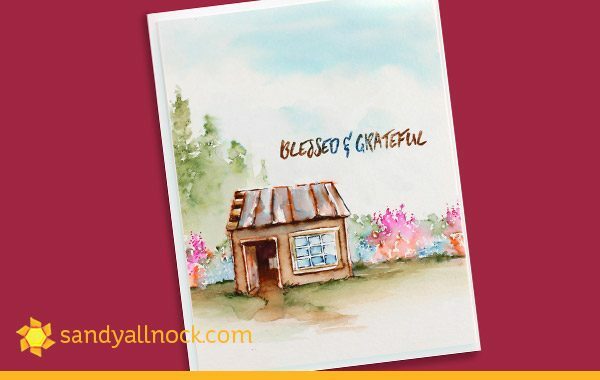 In each of my finished cards I also created multicolor sentiments using a markers and the MISTI – note that these Tombow markers may discolor clear stamps a little, but they’re perfectly usable even with color. For my storage, I use these plastic cases….I break up sets but keep like-minded images together….flowers by approximate size, containers, buildings, bridges, fences, etc. It helps to know which case to go to when I’m doing each portion of a card. Thank you, Sandy. It is helpful to see what you can do with these two sets. I have so many colors, I spend too much time selecting which ones to use. Can you tell us a little bit about the Silver Brush Black Velvet Watercolor Brushes, you are using? Is this your preference over other brushes such as the ones typically used with art impressions? I too did my storage like yours. I took it one step further and put each stamp on a white self grabbing stamp card and then stamped onto the card with stazon ink. This way stamps aren’t misplaced when the ladies come over, then into the large cassettes. This made life so much easier. I also laminated the org. stamp cover page that the stamp comes in and put them all onto a large ring. This makes it easy to know what stamps i have and have the instructions as well as ideas. Great video, Sandy! I love AI stamps and picked up more great tips from you. I also love your storage solution….. I never thought of combining like images, such as foliage, all in one place, and it makes so much sense. I love, love, love watching you colour Sandy! Thanks for this great video! Love your finished cards! I get so excited when I see an email from your site as I know there is a “wonderful” video waiting to watch. Love the watercolors & the stamps. Thank you so much for sharing your talent. I will have to buy these as you “sold” me!! I can watch hours to your colouring, gorgeous. 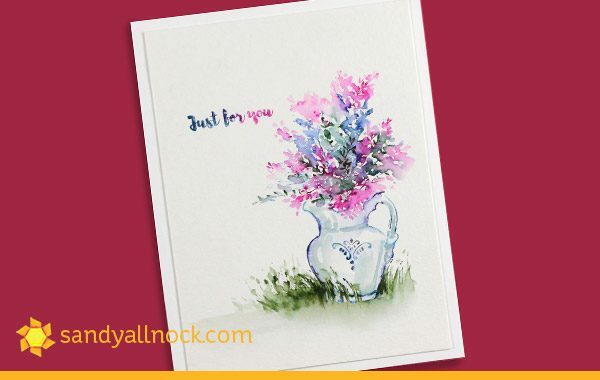 Love all the beautiful cards you made with the stunning AI stamps. Thank you so much for the great video with all the tips and awesome colouring. Have a great weekend.